Comprehensive review of KÜRE Hangover Prevention and Recovery. See what real experts and actual users have to say about this hangover cure. 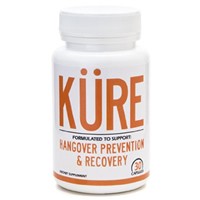 KÜRE Hangover Prevention and Recovery capsules are a great preventative for a hangover. They don’t taste or smell, so they are easy to swallow. Luckily, these capsules should be taken prior to alcohol consumption making them easy to remember. The morning after drinking, I woke up feeling really good and not suffering from any MAJOR hangover symptoms. The ingredients are natural and filled with nutrients, so I didn’t have any side effects. Overall, I really enjoyed using these extremely affordable capsules. However, if you try them and don’t get the results you want, they have a 100% satisfaction guarantee. The capsules are extremely easy to use. All you need to do is take 2 capsules with a 12oz glass of water before you start consuming alcohol. If you want extra relief, take 2 capsules before bed, and again the next morning. Obviously, take the capsules before drinking and before bed if you have more than a few alcoholic beverages. I often forget about my hangover prevention options after I have had a few drinks, so I love that I can take these capsules prior to any alcohol consumption. The capsules don’t have a taste or smell, which makes them incredible easy to swallow. I used KÜRE before a family celebration. At the event, I had about 4 vodka waters, which is plenty of alcohol for me. When I went to bed that night, I thought I might wake up with a stomachache, tiredness, or a minor headache. To my surprise, I woke up feeling great. I didn’t have any major hangover symptoms. If I had drunk more alcohol, I would have taken an additional 2 capsules before bed to ensure some hangover relief the next day. KÜRE contains many antioxidants and vitamins. One of the key ingredients is N-acetyl-cysteine. NAC is an antioxidant believed to assist in detoxification of the liver. B Vitamins are another major component to KÜRE. It contains B1, B2, B6, and B12. Each plays a vital role in assisting hangover prevention. For example, Vitamin B12 is supposedly useful in detoxifying the liver and is believed to improve recovery time from drinking-related symptoms. Another important ingredient is Prickly Pear Extract. This extract supposedly protects the liver from alcohol toxins that often lead to hangover symptoms. Luckily, I didn’t experience any major side effects from using KÜRE. It costs $14.99 for a bottle of 30 capsules. That works out to about $1 per serving.